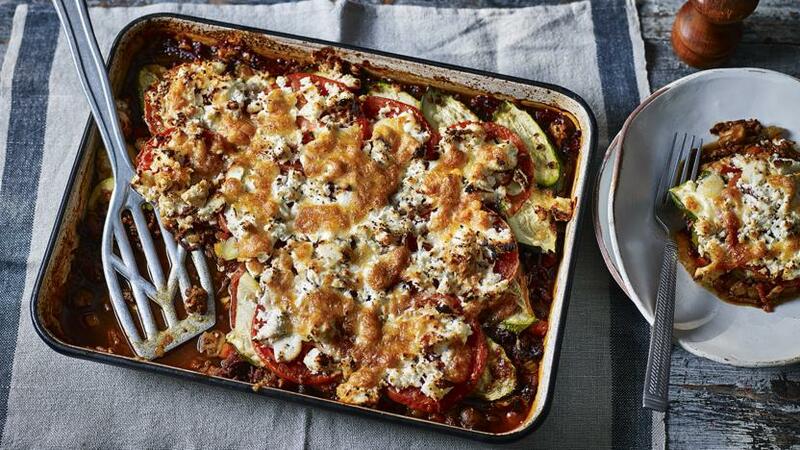 This lighter 'lasagne' saves on calories without compromising on taste. Each serving provides 436 kcal, 45g protein, 20g carbohydrates (of which 16g sugars), 18g fat (of which 9.5g saturates), 6g fibre and 6g salt. Spread the mince out onto a baking tray lined with baking paper. Bake on the top shelf for 40 minutes, breaking it up every 10 minutes. It should be a deep-brown and even colour. Remove and set aside. Keep the oven on. Heat the oil in a large non-stick frying pan over a medium heat. Cook the onions for 10 minutes, or until soft, adding a splash of water if they start to stick. Add the garlic and cook for 1 minute. Stir in the carrots and celery and cook for 5 minutes then add the caraway seeds, stiring for 30 seconds. Stir through the tomato purée and cook for 1 minute. Add the mince, stock, tinned tomatoes, stock cube, herbs and mushrooms. Bring to the boil, then lower the heat to a simmer and cook for 25–30 minutes, or until the sauce has thickened to a rich ragu. Pour the ragu into an ovenproof dish, about 23x33cm/9x13in and 5cm/2in deep. Layer the courgettes then the tomatoes on top, seasoning each layer with salt and pepper. Season the ricotta with salt and pepper and dot evenly over the tomatoes. Scatter over the mozzarella and Parmesan and bake for 35 minutes, or until the topping is golden-brown.